Tzung Yuan Technology Co., Ltd., formerly known as Wu Tzung Electrical Machinery Co. founded in 1980, is a specialized manufacturer of both traditional and computerized balancing machines. 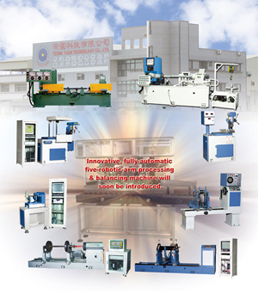 The company boasts that its specially designed machines can fully meet customer's most critical requirements for mass production, reduced production costs, high efficiency, high reliability, and extended operating life. Tzung Yuan mainly supplies assorted balancing machines, ranging from traditional models to digital micro-computerized ones. Concentrating on supplying high-tier products, the company has extended operations to mainland China by establishing such subsidiaries as Dongguan Wuzhen Electrical Machinery Corp., Kunshan Pufo Machinery Equipment Corp., and Jiangsu Beiqiao Corp. Besides manufacturing balancing machines, A+B epoxy resin, and AC/DC power supply, the company also provides professional education and consulting services. Huang Wu-tzung, chairman of Tzung Yuan, says his company has developed a series of new micro-computerized balancing machines for replacing traditional models. The company will soon introduce high-speed automatic balancing machines to the market.